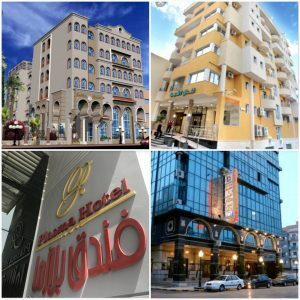 The Safwa, Asshajara, Plasma and Four Seasons hotels (L-R) are examples of well known mid-range hotels in Tripoli (Photos: Social media). Four new hotels opened in Tripoli and Benghazi this month which will help drive domestic tourism, the Libyan Tourism Authority said. The hotel openings will support tourism and help drive the national economy. It will also drive domestic and desert tourism, the interest in cultural tourism and infrastructure projects of the tourism sector, the Tourism Authority explained. In Benghazi, three new hotels were opened; The Corniche Hotel on Khalifa al Mahdawi Street, the Benghazi Lighthouse Hotel on Tripoli Road, and the Hospitality Principles Hotel on the road linking the airport and the city centre. In Tripoli, the Royal Gardens Hotel was opened in Al Dhahara area near the city’s commercial centre. The new mid-range hotels will be a welcomed addition to this particular Libyan hotel sector which suffers from a lack of diversity and competition. It will be recalled that the World Tourism and Travel Council 2017 report made grim reading regarding its expectations for Libya’s tourism and travel sector. While the study took 2016 as its starting point – a year where Libya was experiencing one of its lowest economic performances for decades and experiencing unprecedented political divisions and militia insecurity – the report nevertheless makes a stark warning. Ranking Libya out of 185 countries, the WTTC report put Libya’s tourism sector at 112th in absolute size in 2016, 133rd in relative size in contribution to GDP in 2016, 167thin the table of forecast growth and 107th in long-term growth for the decade from 2017 to 2027. It will also be recalled that Tripoli’s main airport, Tripoli International Airport, was destroyed in domestic militia fighting in 2014. Currently, the capital and the largest urban centre in the country, is using the smaller and underdeveloped Mitiga airport. It will also be recalled that due to the insecurity post Libya’s 2011 overthrow of the Qaddafi regime, there is an EU flight ban to Libya. No major international passenger carriers trevel to Libya.